The BRAND Titrette® is the only bottletop burette that meets Class A accuracy specifications for glass burettes. If needed, it can offer the precision of 3 decimal places below 20mL. It can be quickly and easily disassembled in a matter of minutes - for cleaning, to replace the piston or cylinder, or to replace the batteries. Available in volumes from 10mL to 50mL, and with an optional RS232 communications interface. 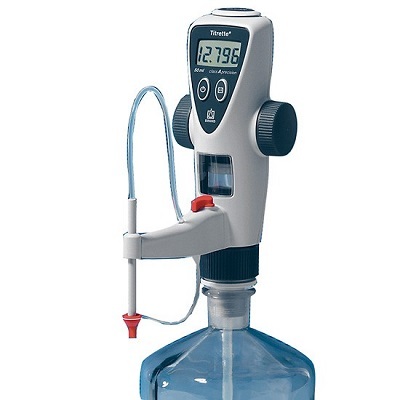 · The Titrette® bottletop burette is supplied with: 45mm thread, telescoping filling tube (170-330mm), recirculation tube, 2 batteries (AAA/UM4/LR03), 3 bottletop adapters, 2 amber colored light shield inspection windows, performance certificate, operating manual, and one-year warranty. Additionally included with RS232 interface: 2m interface cable (9-pin, sub-D plug connector), CD (driver software and open RS232 communication protocol). *The value of accuracy and coefficient of variation are final test values referring ot the delivered nominal volume, instrument and distilled water at equilibrium with ambient temperature (20°C/68°F) and with smooth operation.